The Otto Bock Helix 3D Hip Joint System is suitable for both hip disarticulation and hemipelvectomy patients. It offers patients maximum security and function for a wide range of everyday activities by mimicking the pelvis’ natural three-dimensional movement patterns in the stance and swing phase. Wearers will easily notice how easy it is to initiate swing phase with the hip joint’s integrated expansion springs and miniature hydraulics. Users will also enjoy the ability of interior and exterior rotation, which is lost after amputation, through the Helix3D hip joint system’s unique joint design. The overall result is better physiological experience compared to conventional hip joint systems, which typically allow one-dimensional, forward and backward pendulum movements only. 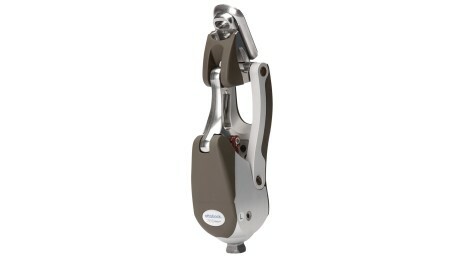 Therefore, the user can accomplish a more controlled, smooth roll-over on the prosthesis under full load. The Otto Bock Helix 3D Hip reduces the risk of users falling, improved posture while sitting, and also makes it easier to accomplish activities such as putting on shoes or getting in and out of car.